Although there are many different types of poker games, every player has to start somewhere and one of the most common places to start is with five card draw. This is because it is a poker game that is very simple and allows players get up to speed with the game. It is far more prevalent in home play amongst friends than it is online in tournaments or casinos but that is not to say that the game cannot be found online. In fact, it holds a place in the majority of online casino and only variations like Texas Hold ‘Em say they are more popular than the five card draw game. Like many poker games, although it is easy to learn the rules and nature of five card draw, it can be very difficult to wink, especially when you are up against experienced players. There are obviously tips and techniques a player can learn to develop their skills and give themselves an edge but the best way to get ahead at five card poker is to follow the rules and play regularly. Like most poker games, observing good players at work and then trying to develop your own style around their techniques is a great way to increase your playing skills and start to win some big money at the poker table. 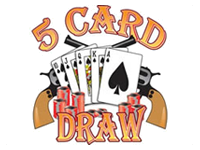 The game of five card draw begins with every player placing their ante into the pot and then being dealt five cards. From here, the player on the left of the dealer will bet or pass, and if a pass is called, play defers to the player on the left once again and they too have the option to bet or pass. If every player passes, the cards should be gathered in, a new ante should take place and play begins with the player on the left hand side of the dealer being dealt a fresh hand. Each player can call, fold or raise after the hand is opened by a player who has placed a bet. Each player that survives is then provided the option to exchange a number of cards for the same number of cards from the top of the deck. Another round of betting takes place and should be started after each player involved in the hand has exchanged their cards or remained with what they hold. After the betting round is complete, all players that have not folded should show their hands. The rules of five card draw may seem a little convoluted written down but once the game begins, they are very easy to follow and makes for a simple and engaging game of poker. The game also provides a great grounding for players to take on into using on different variations of poker games. Poker betting online is slightly different from real life situation in that you are not actually placing poker chips on the table. However, when you play poker online the choices remain the same. In all situations you will be given a combination of four options… you may fold, check, call, or raise. If a poker bet has already been made the option to check will not be available. You must either fold, call, or raise the bet. These will appear as icons somewhere on the poker table screen. The raise button is usually set to a predefined amount for the minimum raise. The process for raising the amount of the bet varies from poker room to poker room, but is usually some version of slide bar in which you slide a marker from left to right, or vertically from bottom to top to raise the amount of the poker bet you wish to make. These “bet slide bar” will usually have one button on either end marker, “max” and “min” which you can use to quickly choose the maximum, (or minimum) allowed bet with a single click. There is often an option somewhere in the file menu of the poker room software to change to style of the bet slide bar to whatever you are most comfortable with. In addition to the bet slider there is usually some place where you can manually input the amount you wish to bet by typing in the numeric value of the poker bet you wish to place. This will appear as a blank box, most likely directly above the poker bet slider. 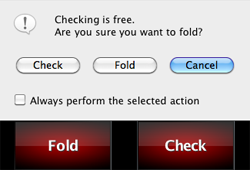 In a few poker rooms- Poker Stars for instance- you may even be given the option to fold when a check is available. However, it is not recommended that you fold when a check is available regardless of how bad your hand stinks. The fact is, a check is a free look at the next card, and anybody who denies that free look is just pain foolish. The strength of your hand could change dramatically from one new card. So whenever you are in a situation in which you don’t want to bet or call, if given the option to check or fold, always check.